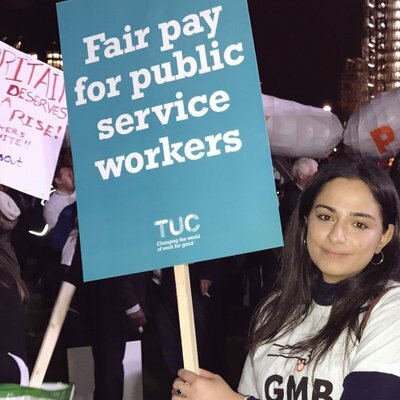 There have recently been controversial discussions within the Labour Party focussing on the relationship the party has with the trade union movement, with some claiming it should be severed. Now, there is no disputing the historic role the trade union movement played in the conception and creation of the Labour Party. However, my worry is that far too often, people fall back on this historical appreciation as the sole reason for the value of our historic links. I think the real value of our link with trade unions lies in the work they do standing up for ordinary people today. I joined the Labour Party to help change the lives of ordinary working people in this country. The only way we can do that is if as a movement we value and grow the link with trade unions. The labour movement was built on the power of collective voice, for and by workers. Every day trade unions represent millions of people fighting for better rights at work and beyond. Their purpose is simple – to defend and extend the rights of workers – and yet they do so much more. Over the past decade we have seen an attack on the rights of workers and the exploitation of those in new and developing industries created by the gig economy. We know that the hardship of austerity and the economic crash were – and continue to be – borne by working people. In these difficult and changing times it is the Trade Unions that have consistently stood up for working people. I’m incredibly proud to be a member of GMB, a general union formed after the amalgamation of more than 100 smaller unions. It was GMB that fought to ensure Uber paid its drivers a fair decent wage and that they had the rights they deserved. It is UNISON who stands with nursing students, who have seen their bursaries cut. It is the TUC who have told this government that a public sector pay cap that punishes our police, firemen and other emergency workers is unacceptable. And today, when we face a catastrophic hard Brexit, I have no doubt that it will be trade unions that stand up for my rights at work – and yours. Despite the ever more pressing need for trade unions, worryingly few people are members. This is especially true of young people. It’s estimated that less than ten percent of people aged sixteen to twenty-four are members of a trade union. Unions and the principles of trade unionism aren’t something young people tend to engage with and that must change. I challenge you to go out into your workplaces and educate people about the history and power of our trade union movement. Each of us who is a member of a trade union has a responsibility to get our friends and colleagues signed up and protected at work. Trade unions are vital to the work of our party. They allow us to have roots in workplaces across the country and they make sure ordinary working people have a strong and powerful voice – a collective voice. At a time when our rights are under threat and trade unions are the ones always on the side of working people, the idea of disaffiliating is dangerous. It would also play into what the Tories have been saying about trade unions for far too long. Those who seek to destroy our links and to discredit the importance of trade unions pose a threat to collectivism and to the future of our party as a strong voice for the disadvantaged. Eda Cazimoğlu is a National Policy Forum member and a CLP Youth Officer.